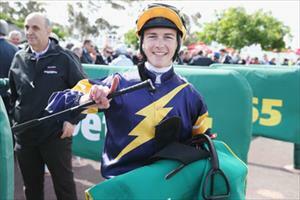 Mike Moroney and Pam Gerard has the services of Melbourne based jockey Patrick Moloney on Friday at Otaki. The training partners recently enlisted fellow Victorian Jake Bayliss, who made a fine start in riding nine winners since arriving earlier in November, before being suspended until 3 December. “He’s our stable rider and the decision was made mainly due to the fact that Jake was suspended and we’ve got horses getting ready for important stakes races,” Moroney said. Moloney will ride trial performing two-year-old debutante Bocce (Foxwedge) and terrific last start winner The Boy Wonder (Cape Blanco) in the Wellington Stakes (Gr. 3, 1600m), along with Ali Baba (Savabeel), at Otaki, and has the ride aboard dominant last winner On The Rocks (Alamosa) in the Trevor Eagle Memorial (Gr. 3, 1500m) on Saturday at Ellerslie. Moloney (23) is ranked 11th in the premiership standings this season and overall ridden 353 winners.